Providing you the best range of Vial Washing Machine such as Automatic Rotary Vial Washing Machine, Automatic Linear Vial Washing Machine, High Speed Vial Washing Machine and Multijet Vial Washing Machine with effective & timely delivery. We are among the reputed names in the industry for manufacturing and exporting Automatic Rotary Vial Washing Machine. The offered machine is made from high-grade materials sourced from a reliable vendor base and is known to serve for a long period of time. This machine has high tensile strength, is non-corrosive and user friendly. It is operated automatically and used for the washing of vials in cosmetics and pharmaceuticals industries. We are among the distinguished names in the industry for manufacturing and supplying Automatic Linear Vial Washing Machine. The offered machine is used for the washing of ampoules for filling medicines and cosmetics in pharmaceutical and cosmetic industries. This machine is user friendly, compact in size and sturdy in terms of housing. It is energy efficient as well. Our organization is among the leading names in the industry for manufacturing and supplying Multi Jet Vial Washing Machine. The offered machine is robust in terms of construction and meant to serve for a long period of time. It is energy efficient and easy to operate. This machine is used for the washing of vials in pharmaceuticals and cosmetics industries. It is compact in size as well. 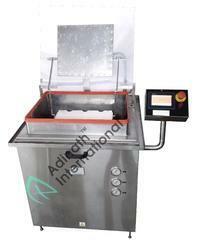 Lab Scale Vial Washing Machine is most popular washing machine for the washing of ampoule & vials. Machine is having all operation automatic except loading & unloading of ampoules/vials. Machine is most economical equipment for the washing of inject-able glass containers. Automatic Linear Vial Washer is uses for the washing of pharmaceutical glass vials. Machine is having six washing station for complete inner & outer washing of pharmaceutical glass vials. This model is most suitable for the online untouched aseptic filling line. Vials pushed from in feed tray and then move on wire woven conveyor belt, which align the vial in correct position, to enter in to the carrier pocket with help of oscillating guide rails. Oscillating arm deliver the vial inside pocket in mouth down position over spraying nozzles. Multijet sprayers fixed at the top cause the total external and internal surface to be washed. To avoid any possible cross contamination between two different waters, each washing station is provided with an independent circuit. Carrier pocket is moving with indexing motion. When the baskets have completed their motion the needles are lifted. They penetrate the vials, spraying jets of water or compressed air then return down. The baskets movement then advances by one station. Each station of vials passes through the washing cycles selected. The duly washed vials then delivered to the out feed tray with neck opening upward and then automatically re ordered to sterilizing tunnel with back pressure. Power Supply (Pumps) 2 H.P. Power Supply (Conveyor) 0.5 H.P. Compact Vial Washing Machine is most popular washing machine for the washing of ampoule & vials. Machine is having all operation automatic except loading & unloading of ampoules/vials. Machine is most economical equipment for the washing of injectable glass containers. Vial Washing Machine is most popular washing machine for the washing of ampoule & vials. Machine is having all operation automatic except loading & unloading of ampoules/vials. Machine is most economical equipment for the washing of injectable glass containers. R&D Vial Washing Machine is most popular washing machine for the washing of vials. Machine is having all operation automatic except loading & unloading of vials. 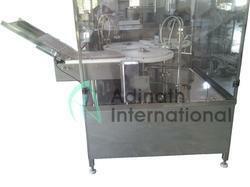 Machine is most economical equipment for the washing of injectable glass containers. 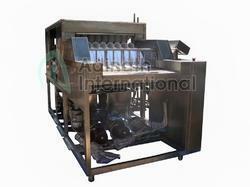 Automatic Vial Washing Machine is specially designed to wash Vial with minimum contact of machine parts with Vials. Machine with specially designed Gripper system holds the Vial from Neck and invert the Vial till the washing operation completed and again after washing release the Vial on out feed feed worm system in vertical position ensures positive wash of Vials. Machine is suitable to wash 2ml to 100 ml Vials with the help of change parts, Vial feeds through feed worm to indeed Star Wheel and specially designed Gripper hold the Vial from neck and invert the Vial and move it further on rotary moving system for washing process.